Does the success of your business rely on your own personal brand and the exposure you have in the professional community? Imagine if you could double your online networks in just 3 months – how would this affect your client pulling power? It sounds simple, but growing your network does take a little time and effort. Here are some things you might wish to invest a little time into:Get the Year Book outIf you’re not already an active player on LinkedIn, you’re missing out on a wealth of opportunity. LinkedIn is the professional playground for those who want to become a key influencer in their field. Because LinkedIn only really took off a couple of years ago, there’s probably many people you’ve met in a professional or social capacity, whom you’ve not yet connected with. Set aside a whole day to rummage around your mental rolodex of colleagues, friends, university classmates, acquaintances, suppliers, clients and even your extended circle of family and friends. Think even outside the box – people who you’ve spoken with but not done business with. Don’t be afraid to connect with high profile people too, if you’ve dealt with them in some shape or form. You’ll very quickly discover that LinkedIn is a gold mine.Select three LinkedIn Groups and get activeWhen you find out where your customers hang out, it’s time to start building a relationship with them. This doesn’t involve direct selling – what I mean, is engaging in topical conversations related to your field, displaying your expertise in a way that adds value to your customers. If your customers aren’t hanging out on LinkedIn, you may want to consider Facebook groups. Whatever groups are appropriate to your customer base, you’ll be able to understand whether they’re the right groups for you just by listening to the conversations. Observe the conversations that unfold. If you’re not able to engage in the group conversation topics at least once every few days, you’ve joined the wrong group. Choose two social media channels and do them wellDecide on two social media channels that you enjoy using and that are relevant to your customers. Do these well and forget the rest. Your profile will benefit much more from being highly visible and consistent in two channels, than doing bits and pieces in four. That way, when you connect with new people, they can see you’re active and (hopefully) interesting! Put on your power suit and say ‘yes’Your ‘power suit’ doesn’t necessarily have to be the traditional one. By power suit, I’m referring to the ideal version of you, you wish to present to the outside world. 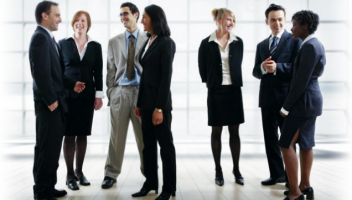 Don’t turn up to networking events with lack-lustre attire or personality. Turn up with purpose, with business cards in hand and with reams of enthusiasm. Be that person in the room who people want to talk to. If you’re serious about expanding your networks, physical events are a great way to develop relationships that go beyond likes and tweets. Research the events in your area that are relevant and go to as many as you can. Some you’ll perhaps only go to once and some will become your regular platform for meeting new people. As you start out, try and say ‘yes’ to as many as you can. One useful contact could open up a whole world of opportunity Create the HabitEach time you meet someone new –it doesn’t have to be a potential client, connect with them on all your social media outlets the day you meet them. Don’t leave it pass a few days and eventually get around to it. By that time, you may well be a distant memory of theirs. Your new contact might only be a new colleague, your new hairdresser, a friend of a friend you met briefly, but there are two important things to remember here. Firstly, they know a lot of people you don’t know. Secondly, this habit is a good one to have, because you will grow your network with what seems like minimal effort. Songkran in Thailand is New Year and it is celebrated every April. Songkran comes from the Sanskrit language. It means "movement" or “changing" and is a traditional festival that lasts for three days. In the old days Thai people would pour scented water over the shoulder and down the back of one another to wash away the sins of the previous year. They would also utter good wishes and blessings for the New Year. The water symbolises cleansing, refreshment of the spirit and all the good things in life. Now-a-days Songkran is more like a crazed carnival of people throwing water on one another, so during the festivities you can’t leave your home and go out without getting at least a little bit wet and in most cases, completely drenched. Makes it interesting when you’re not quite sure where the water you are being sprayed with originates from and in many cases the bins of water used to replenish the guns and buckets have huge blocks of ice in them, giving you a shocking blast of freezing water in the back! Thank goodness the festival is held in the hottest month when it’s 42 degrees Celsius (105 Fahrenheit) and it doesn’t take long to warm up again. It was incredible fun celebrating Songkran this year, but of course, I found a great personal branding lesson in the festivities. What I learned from Songkran was that it’s OK to get it wrong and make mistakes, because you can start over and wash away the past. In fact you should expect to screw up at some stage this year with your branding and marketing…making mistakes is how life works. If you are afraid of making mistakes you will never get to experience what your personal brand could really become. You will always play safe, never step outside your comfort zone and never really get to live your brand. Stuffing up is probably better thought of as failing forwards, so here are my ‘failing forward to success’ tips for your personal brand: Lesson 1: Have Fun! 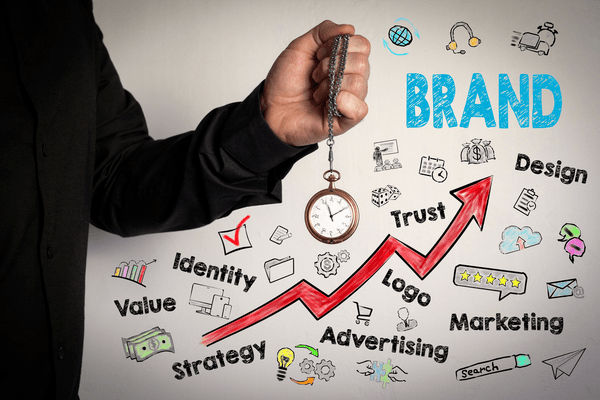 Don’t worry about making mistakes, make them part of your brand development. Be prepared to be human, to get wet, to take a few buckets of ice cold reality every now and then. You don’t need everything to work perfectly, in fact, if you want to be totally authentic with your personal brand, it’s far better to be human. Lesson 2: Join In! Business is better with others. It’s amazing how fast you can make friends and get into a crowd of fun people when you have a massive water-fight going on. When you launch your brand you will need supporters to help you up when you get knocked down. Choose the ones who are prepared to get wet themselves and have fun along the way. Don’t try to do everything on your own. Join in, network, surround yourself with supporters & people whose personal brands inspire you. Lesson 3: Make A Splash! Get in and immerse yourself, live your brand full-out. There is zero chance of staying dry in Chiang Mai during Songkran and in business there is zero chance you will get an entirely pleasant ride. There will be pot holes and drenching along the road to success, you will get shot in the back and attacked by surprise but don’t let that stop you from playing your own game with the big boys and creating a name for yourself. Lesson 4: Don't Blame Yourself! We didn’t even have a water gun or buckets and we got completely soaked. We wore suitable clothing, sunglasses, sunblock and had our phones and money in waterproof bags. When you market and promote your services, sometimes stuff happens and you have no control over the outcome. Strong brands do survive, so make sure you are prepared for the inevitable and when you get a dousing, you’ll be able to pick yourself up and carry on. Lesson 5: Package Your Skills! Bah Humbug. Being our first Songkran we asked for advice from online forums and many of the responses were “get out of town” or “lock yourself in your house for 3 days”. Many grumbled that the old traditions of gently sprinkling water on the shoulders had been replaced with a hooligan style, out of control, 3 day mass water-fight. The point being that humans will go with the flow, even if it isn’t tradition. As much as you might want to take the high road, choosing your own style and marketing yourself based on what you think your target audience wants, it’s better to get to know exactly what their needs and desires are before you brand yourself. Then you can package your skills and talents in such a way that you are true to your authentic self and at the same time, be highly attractive to your ideal prospects. 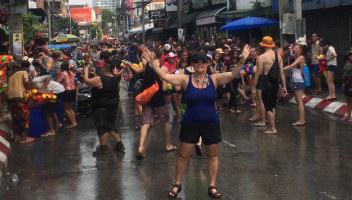 Songkran taught us a valuable branding lesson not to fear the unexpected. To embrace movement and change as part of the landscape in which we do business. Never assume anything, be as prepared as possible but make sure you step outside your door knowing that, even if you come home soaking wet, you will still have a massive smile on your face because you are out there, doing it. Tell us a bit about your business? Blue Clay Productions is a video production company based in Sydney and Wagga Wagga, offering a wide range of services from filming, editing to motion graphics. We also increase the online presence of clients by creating strategies and creative, compelling video content that fits our clients’ marketing needs and budget. Some examples of how we might do this is through creating a television commercial, online promotional film or live streaming an event. We started a regional arm in March 2012 and work closely with SME’s and tourism operators. Why did you start up your business? I’m a journalist by trade and love telling stories. When I was working for a major current affairs program I was often approached by businesses and individuals who wanted to share their story. Some of these businesses were paying PR agencies thousands of dollars just to write a press release. Then you have the ‘big boys of business’ paying tens of thousands for online videos – even more for a television commercial. It’s just not feasible for SME’s to pay this kind of money. When you consider the power of online video in terms of audience reach and the various ways you can use it to tell and sell, it’s a perfect platform for SME’s. Teaching this market how to use online video and creating affordable content has been a successful recipe. I also saw a gap in the video production market – particularly when it came to corporate films at a reasonable price. Many were able to pick up a camera and edit some footage but few were able to really tell a good story. What are the major hurdles you experienced when starting up your business? Getting runs on the board in the first few months was a hurdle. I enrolled in a small business course that really made me look at the direction of my business, my market and my competitors. What was my edge? What was the one thing that made my video business different? The answer was ‘me’ - that being my experience and training. So I ran with it. I attended every free (or cheap) networking and training event I could. I made cold calls and I turned on the charm without (hopefully) seeming too desperate! Rejection is a very hard thing to deal with but you need to use it as fodder to keep going. Once you get momentum you gain more clarity and confidence. Also, capital can be a difficult obstacle but it doesn’t have to be. There are low interest unsecured loans that can easily be obtained. Research it through your local Business Enterprise Centre. What tips can you give other SavvySME members that are thinking or in the process of starting up their business? Do your research and do a proper business plan. Starting a business is like building a house – you need strong foundations. Don’t skip this and ensure you spend proper time on it. There are lots of short courses you can do to help with this process and templates that can show you the right format. Market yourself and get out there. How? Do I need to say it? Video marketing is great for people on a budget who want to build an online presence. You don’t need thousands to produce quality video content however remember that you need to protect your brand. Don’t send anything live that will do more harm than good to your product/service. Think outside the box and think of ways you can use video to reach your audience. You could simply do a vlog (video blog), a product demo, an office tour or you could engage a video production company to create a professional film for you. Remember to ask yourself, ‘Who is my target market and what are my key messages?’ Remember, Google loves video. Also, create partnerships and explore pro-rata deals. The first big contract I scored was after I already worked for this particular company through a sponsorship deal. It meant that they got to ‘try and test’ my services before they handed over a cheque. It actually lead to many other contracts. I still take this approach when I am trying to break into a new sector. You won’t see the rewards the following day though. It may take months if not a year or more to see the full return on investment. What made you decide to take the jump and focus on your business? When I first returned to Australia from working overseas for a couple of years as a journalist and producer, I found it difficult to find full-time work that wasn’t based in the news industry, which I’d grown tired of. I had a plan when I returned to open my own video production company however I needed capital and some training. I worked part-time while I completed a business course and also during the first eight months of trading. How did you family and friends react? My friends and family, like so many others, often said they supported me but they often questioned my sanity and regurgitated facts like, ‘One in three businesses fail in the first two years of business” etc etc… Some perhaps thought it was a ‘phase’ I was going through; others knew how tenacious I am so they didn’t question it. You just need to remember to take it slowly, do your research and preparation and be passionate! If you aren’t passionate there is a good chance you will become a statistic and no one wants to hear ‘I told you so’. How has your life changed? Wow, where to start? I work harder, longer and in the beginning sometimes for a lot less money… but I am now more passionate about life, work and the future. Expanding to regional NSW has brought a lot of opportunity and exciting paths. I have also learnt what my ‘business style’ is and how it works for my company and me. Oh, and I can pull a sick day and take leave without asking the boss. What success have you experienced since starting your business? Blue Clay Productions has managed to secure a number of great contracts and establish fantastic relationships with key bodies in various sectors ranging from tourism, universities and media. In 2012 we filmed a documentary about the woes of dating in Sydney. We took five single women fed up of dating ‘pretentious city guys’ on a road trip to meet men from various backgrounds. We drove from Adelaide to Rockhampton meeting all sorts, from farmers, professional athletes to Irish miners. It was a mission to say the least. We also made the move to open our regional branch, which has opened a lot of doors for us. This year we will be opening a Media, Arts and Business Centre in the Riverina where we’ll conduct training, mentoring programs and networking events. Exciting times. What is the vision for your business going forward? We really want to expand further into Melbourne and run more workshops across the cities and regional areas to teach people the value of video marketing and story telling. We are aiming to become the go-to agency for regional video production in southwest NSW and established training and a support base for SME’s, young entrepreneurs and artists through our centre. What tips can you give other SavvySME about motivating yourself to push through the challenges that rise up while building your startup? Network and talk to other people who are starting up their own business. Join a young entrepreneur or business group in your area. You aren’t alone and you might be able to troubleshoot issues with them and form great alliances at the same time. Don’t put too much pressure on yourself to be the biggest and best within a year. Set realistic expectations but aim high. Also, make small goals and targets that you can tick off and gain a sense of accomplishment – and reward yourself when you get there. But most importantly? Remember to have fun! Providing a community service with shoes! Tell us a bit about your business? Glamazon Shoes is a niche market business. We provide beautiful women’s shoes for bigger feet with sizes starting from 10 and going up to at least size 13, and some up to size 15. Glamazon Shoes has a shop in Melbourne and an online store as well, supplying gorgeous shoes to women (and cross-dressing men!) all over Australia, and even some overseas. Why did you start up your business? I’d had the idea for a ‘big shoe shop’ for decades but never had the courage or confidence to act on it so it remained just that, an idea. After uni, I did the corporate thing for almost 13 years followed by babies and then working the other end of the spectrum, as a small business consultant. But the idea for Glamazon (even though it wasn’t called that yet!) was always there. Finally, I mustered the courage to go out and actually get it off the ground, around 3 years ago. I’m 5’11” and have size 11 feet and buying shoes has been an ordeal ever since I can remember. Years ago, you were lucky to find size 10 shoes in shops, never mind size 11, and if you did, they were almost always ‘sensible’ or just plain frumpy. So I lived in men’s runners and Doc Martens. I refused to settle for granny shoes! What are the major hurdles you experienced when starting up your business? The biggest one would have to be a lack of knowledge about the footwear industry. I had plenty of business experience but not in this area, so that was quite a steep learning curve. Also, doing the venture on my own has meant that I have to be a jill-of-all-trades – web manager, salesperson, writer, visual merchandiser, marketer – everything! There’s no-one to delegate to and that can be quite difficult at times. What tips can you give other SavvySME members that are thinking or in the process of starting up their business? Put together a solid business and marketing plan and do lots of market research. Clearly define your market and if possible, quantify it. Figure out your USP – unique selling proposition – as this is going to be the reason (hopefully) that people will want your product or service. How are you different from the others out there? Price shouldn’t be the differentiator. Also, be wary of other businesses who will all try and sell you their wares/services. Get second opinions and quotes from more than one supplier and don’t rush into any expenditure based decision. What made you decide to take the jump and focus on your business? Age and the confidence that comes with age. Could have been a mid-life crisis but after carrying the idea for decades, I knew I would regret not giving it a go. How did you family and friends react? They were extremely supportive and excited for me, especially my 3 young daughters. Maybe it’s a shoe thing! How has your life changed? When I was in the corporate sector, I was earning a very good salary but felt empty and dissatisfied with the work I was doing. It was a drudge. Now I have the complete opposite. As a new business, my wages are, let’s just say, nothing to write home about, and that’s after not paying myself for quite a long while, my hours are just as long but I love what I do. I get an extraordinary amount of satisfaction from most of the wonderful customers I meet and it never fails to thrill me when I see how ecstatic they are at being able to find beautiful shoes in their size. Especially for those whose feet measure size 14 or 15. It’s incredibly satisfying, especially when they return with each new season. It’s like seeing old friends. What success have you experienced since starting your business? I’ve had a couple of PR wins of my own undertaking and got featured in the Herald-Sun as well as The Age (Melbourne newspapers) which got syndicated nationally. That was a wonderful boost for general branding. What is the vision for your business going forward? I would love for Glamazon Shoes to go national. I think there’s definitely scope for other stores interstate, as well as growing the internet side of the business. What tips can you give other SavvySME about motivating yourself to push through the challenges that rise up while building your startup? Network with other small business groups and especially those with women. Female business owners tend to face challenges that are unique to our gender and it can really help to speak to other women who may have faced what you do. Small business logo design can be a difficult avenue to go down, although it might seem as simple as just asking a designer and them coming up with the perfect idea; that’s not always the case. Even if you design the logo yourself, you might need to think twice before going ahead and using it. What looks good to you, might not necessarily work for others. Hiring a designer: Designing a business logo is not a task that should be taken lightly. When you decide which designer to use, make sure you take a look at their previous work and see if you like the kind of things they are designing. All designers will typically have a portfolio or website with samples of their work and, you’ll be able to make a good decision based on their existing designs. After choosing the designer, you’ll want to contact them first and tell them what your company image and brand should represent; they’ll definitely be able to come up with a few good ideas. Designing it yourself: If you are wondering how to make a business logo for yourself, look to create something simple, easy to read and timeless; the basics of logo design. If you are unfamiliar with colour schemes and how to use them, try to visit a site such as kuler.com, which has a number of great colour schemes to give you ideas in your design. It’s also a great idea to look at a few other small business logo design options too for ideas; there are a number of sites online with large amounts of existing logos to take a look at. Look at the kinds of colours they use; what things come to mind when you see that image? These are all important elements and should give you some great ideas. Opinions and ideas: Once you have a few ideas or samples, it’s good to try and get an opinion on these, here are a few ideas to try. Try asking friends and family: When designing a business logo, you may reach out to family and friends for an opinion. Although asking friends and family can sometimes give a skewed response (for example your design against a professional designers), it can still be a great idea to get a general opinion on a logo. Ask your customers: If you are an already established company, why not show your small business logo design to customers or clients and see what they think, this could be done in a survey. The best way I could suggest is through online channels, with social media being so accessible, it’s also a great idea to do this on your companies Facebook page (alternatively on your website). The first thing you should do is narrow it down to 3 or 4 choices, and then see which ones they like best, perhaps even offer someone who chose the winner a gift as part of a prize draw. Ask your staff: Your staff can be really great to go to for opinions; no one knows your brand ideals better than them as they are dealing with the customers each day. Designing a business logo is not something that comes naturally to everyone, but your staff will at least be able to offer you an honest and truthful opinion on any design that you may have already short-listed. They can look at the logo ideas you have and give good feedback on whether it represents the brand or not and how they feel about it. In fact, why not ask them for some ideas on colours and fonts, then you could have a vote on which ones are best. You may even find that you have a few budding designers among them. Keeping these ideas in mind, it won’t be too long before you have the perfect logo. There is one thing every Australian business and business owner will face, especially as they start to do well. 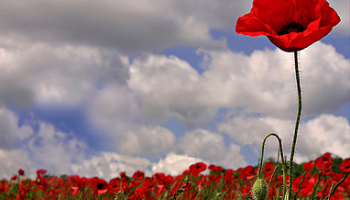 Tall poppy syndrome. For some reason we have been brought up for generations to cut the people who stand out from the crowd back down to size. The romantic notion of it for society is great, a "we are one" mentality helps bring us together. But in business, it's killing us. Part of the problem is, in some ways, the understanding of what entrepreneurs and start-ups are. It isn't a movement business in Australia has embraced as much as in other places and there is a breakdown between the perceived and the reality. Part of it is the deep seeded idea that business is in some way wrong or bad, and therefore has to be kept in check. So then, what is the key to letting a business stand tall? There are fantastic businesses throughout all industries in Australia, driving new and innovative products and services. They are things we should be proud of and sharing with the world. Unfortunately, it seems to be that until there is external validation from somewhere else - usually the USA or Europe, we won't get loud. It's the same thing that used to happen (and to an extent still does) with Australian music, and it has to stop. We're hearing a lot about the need for Australia to diversify its economy, moving away from the traditional reliance on minerals and agriculture. It's a valid and true assessment, but the problem isn't all as scary as it is made out. We have the talent, the creativity and the drive. Unfortunately we just aren't proud and supportive enough of it to enable it to succeed. There are Aussie entrepreneurs driving amazing projects which are literally changing the world and changing industries. Most of them have left Australia to make it happen though. There are a range of issues that drive the move away, including (and significantly) access to levels of investment and funding which really enable ideas to become great products. It is an important part of our business landscape that needs to evolve to keep up with the rest of the world. Things do need to change across the spectrum, but to make that happen we need to make our voices heard. As start-ups we are small, and our budgets are tight, we need to think outside the square to make ourselves heard because we can't spend to compete with big advertisers. I don't see this as a problem though, after all, our point of difference is that we are different, thinking outside the box is why start-ups and entrepreneurs do what they do. Being a single tall poppy though doesn't work. It's tough to get coverage, to be supported and to convince your audience that you're genuine and credible. Not because of yourself, but the bias towards (or rather against), individual success. Whether you're communicating with your market, your customers or a media audience, breaking down that bias is the most important way to get through to them. My solution then, is this - band together. The start-up community is always growing in numbers and support for each other, we should use it. Instead of going one out, present as one voice tackling issues and providing solutions. There is an enormous array of platforms for start ups to speak from, from who works together, who's work compliments each other's, where companies are based and where is a hotbed for a new industry, social change brought about by start-up communities and how many people a "small" start-up community actually employs. By presenting as one, as businesses breaking the mould and working together to overcome problems, not just make money, the voice is loud and clear. Remember too that it's ok to disagree with a popular opinion - that is part of what makes small business different, the willingness to look for something better. It's a golden rule with media to link to an issue, the start-up and small business world is made for it. So link together, share what you're doing and why you're changing the world. The more voices singing the same song, the more people can't help but listen. Tell us a bit about your business? Women Love Tech is a unique techno-lifestyle blog for women, it's informative, accessible, no 'geeky talk' and sometimes with a touch of French humour. The blog is filled with everything women love, whether it's cool gadgets, shopping apps, the latest travel tips, social media news, blogger tips, beauty and fashion, and much more. Why did you start up your business? 18 months ago, my girlfriend lunches turned more and more "as a techno crash course", so the concept of Women Love Tech was born. The blog is online since the 2nd January 2012 and is growing week by week. What are the major hurdles you experienced when starting up your business? I'm born in Paris but call Sydney home for 12 years now. I was a bit worried that my English wouldn't be 'academic' enough, saying that I write like I talk to my friends and my English is probably better than your French :) I was a bit nervous as well to create enough good content to fill the blog and more important to know if my articles will interest women to come back. What tips can you give other SavvySME members that are thinking or in the process of starting up their business? Do something you are good at it and you are passionate about - because when you work 10-15 hours per day, you appreciate to do it on something you love! Do lots of research before starting your business, it can takes months, more you do your research better you will be at your business. e.g. look at the competition, know about branding, marketing, advertising, networking, social media, finances, and don't be scared to work long hours. What made you decide to take the jump and focus on your business? I am working as a freelancer Graphic/Web Designer for years, so my entrepreneur's mind is always set up on developing new business ideas. I created Women Love Tech because I found a gap in the market for professional techno-savvy women. I have found that women are very smart, with a busy life balancing between work, kids, housework, duties as a wife and social lives. After months of research I couldn't find a site which had gathered all the technology information I needed without be bored or without being lost in translation with the 'nerd language' so I decided to created my own. Women Love Tech is like having lunch with an expert girlfriend. How did you family and friends react? Amazing, I think they realised (before I did) how Women Love Tech with my 10 years digital experience could help and empower women. I am so grateful to have their love and support. How has your life changed? I've always been a workaholic but now I work even more, 7 days a week, all year, (sick or tired), but with a difference I really love what I do, it's very addictive. As well, when I am invited to some new product launches or functions, PR and journalists recognised me as the 'French nerd on high heels' (laugh) - joke apart, my job can feel like living in a bubble spending so many hours alone behind a screen so I try as much as I can balancing work and social life. What success have you experienced since starting your business? It took a while, I don't know how many times last year I asked myself should I keep going or not? It's a normal process when you start a business - everyone has ups and downs. But when big companies (via PR's and advertising agencies) like Samsung, Dell, Phillips, Microsoft, Nokia, HTC or Sony contacted me. I understood my blog was on the right direction and the hard work started to pay off - One of the biggest sign of success I have experienced is with my Facebook page when it's started in March 2012 with 12 'likes" from my friends to now with over 5500 followers. What is the vision for your business going forward? My vision for this year is to have more women reading Women Love Tech while still delivering quality content - it's going to be an exciting busy year. What tips can you give other SavvySME about motivating yourself to push through the challenges that rise up while building your startup? Never give up, be patient, discipline yourself, practice a sport for the stress, eat & sleep well, you will need the energy to run your business. Learn to be organised. If your business involve computer, softwares, phone, tablet, etc... have the quality ones as you don't want them to let you down when you are in a middle of a project. Don't be shy to ask for help when you need it. Stay sharp with technologies.